The LG LMU187HV Dual Zone Outdoor Condenser will provide you with 18,000 BTU of capacity for hot summer days and cold winter nights. LG maximized the efficiency and economics of duct-free technology used in mini split heat pump systems. Now you can bring more attractive, cost effective solutions to your commercial and residential applications, providing one, two, three or four zones of both air conditioning and heating needs. This complete system creates the perfect climate control for your space and makes any application fresh and comfortable. Flex Multi-Split systems operate one, two, three or four interior units that are mounted in separate rooms. Each indoor unit comes with its own remote control, allowing the customer to set the temperature individually in different rooms. These units are connected to a single outdoor unit. The indoor units are available in a variety of styles, including Standard Wall Mounted, Art Cool Wall Mounted with customizable mirror finish, Ceiling Cassette, and Ceiling Concealed Duct models. 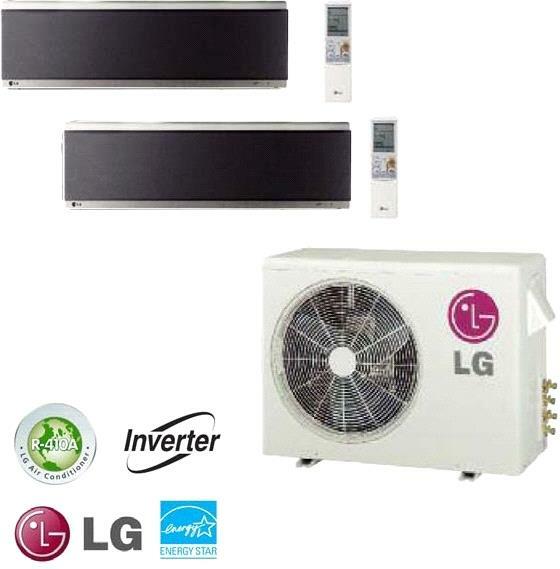 LG LMU187HV Dual Zone Outdoor Condenser uses an inverter, which uses a variable speed compressor that is quieter to operate and uses less energy than conventional air conditioners. When the selected temperature is reached, the inverter compressor operates at low speed to maintain that comfort level. LG inverter models have efficiency ratings of 16.0 - 19.7 SEER, making them among the most energy efficient in the industry. Plus, with capacities ranging from 9,000 - 48,000 BTUs, its easy to find a unit to match any size room. Finally, when the weather turns cold, its reassuring to know that the LG LMU187HV Dual Zone Outdoor Condenser offers more heating power than conventional mini split heat pump systems. Whats more, LG inverter models are as stylish as they are efficient. Multi Power System. Energy-saving twin compressors: one provides power at 60% capacity until the system reaches a desired temperature. Then the smaller compressor takes over to provide sustained operation at 40% capacity. R-410A Refrigerant. Environmentally friendly refrigerant utilized in the majority of LG systems. Patented Plasma Air Purifying System. The 4-stage system features a large, permanent filter and an electronic air purifier that captures microscopic contaminants like dust, mite, pollen and pet fur. Self-Cleaning Indoor Coil. Drives dirt and moisture from coil surface leaving it clean and fresh smelling (Art Cool Models). Dehumidifying Mode. LG Indoor unit accurately senses room temperature and controls humidity by shutting down the compressor before a room is over-cooled. Chaos Swing. Electronically controlled louvers and fan speeds create a more natural, random flow of air, reducing temperature stratification. Art Cool Three-way Cooling. Air flows out of the unit from three directions, creating more natural circulation. Jet Cool. Operates at high speed for up to 30 minutes to quickly cool a room down to 64 F.
Swirl Wind. Four-way controlled louvers and fan speeds create a stronger, wider air flow and reduce temperature stratification. Auto Operation. Provides three levels of comfort from which to choose. Temperature and fan speed will set automatically. Manual Power Switch. Easily accessed button allows for continued operation if the remote control is misplaced. Defrost Control. Shuts down the indoor fan to prevent cold air from being blown into the house. Removes frost from outdoor coil when the outdoor temperature is low. Temperature Display. Shows room temperature of interior unit. Auto Sleep Mode. Automatically increases the temperature setting 2 F twice (after 1/2 hour and one hour). The interior unit shuts off when the timer setting is reached. Auto Restart. Automatically restarts a unit to programmed setting when the electricity comes on after a power failure. 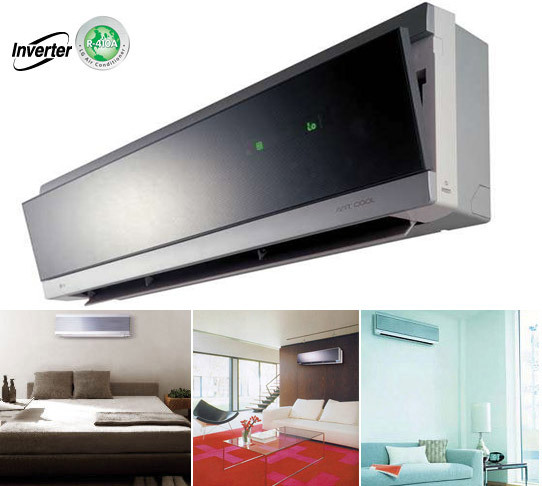 BELOW IS JUST AN EXAMPLE FOR INSTALLING MINI SPLIT AC, it will vary with the brand you will buy! We do not encourage homeowners to install the split air conditioners, below demonstration is for information purpose only. A lot of customers have called us asking if they install the unit without the licensed AC company, will their warranty be void? Answer to that question is Yes. Unfortunately no brand or manufacturer can take the responsibility of the equipment if it was not professionally installed. TIP: Installing a split AC is easy for any AC company, but can get tricky for a homeowner. We as a company cannot encourage a customer to install the split AC, but have seen a lot of customers do it in the past successfully. At the same time we have seen some customers installing the unit unprofessionally without performing all the necessary steps, which resulted in issues with the AC unit within the first 3 months. In short, you can do all the handyman work yourself but can hire an AC company to finish the important process on the Split unit. For example you can drill the hole in the wall, run the copper lines and connections outside, hang the indoor unit on the wall carefully and then place the outdoor unit outside on a concrete pad or a flat surface. But there are some steps you cannot perform as you do not have tools for it. Which is where your AC company gets involved to finish all the necessary steps. For example they will vaccum the lines, check for the leaks and then release the refrigerant.